ALLEGRA BOVERMAN/Staff photo.Gloucester Daily Times. 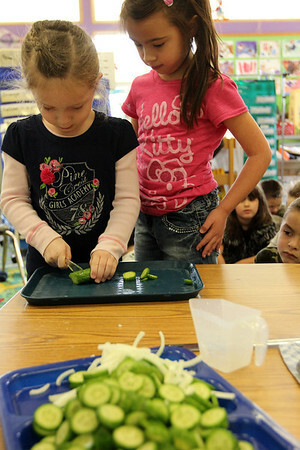 Gloucester: FoodCorps and CitySprouts hosted "Pickle Pioneer" day at Veterans Memorial Elementary School on Thursday. The kindergarten class taught by Janet Allen actually made pickles out of cucumbers and onions, sugar, vinegar and salt. Students each helped slice cucumbers, including, from left: Molly Pennimpede and Kajsa Curcuru.